View More In Wash Bottles. This Nalgene Boston round wash bottle has an LDPE body, a molded, angled spout, and a polypropylene screw cap. This wash bottle is used to wash labware and to store washing solutions, such as acetone or deionized water. The LDPE (low-density polyethylene) body is lightweight, flexible, and elastic, has an opaque hue, and resists impact, stress cracks, and moisture absorption. Its Round shape used for a wide variety of common applications that require fluid containment. This lab bottle has a spout that is molded into the bottle's body to prevent cross-contamination and eliminate the need for a draw tube. Its angled dispensing nozzle directs the stream of liquid. The spout tip can be cut back to increase the flow of washing solution. The bottle has a polypropylene screw cap to secure contents and help prevent spills and evaporation. 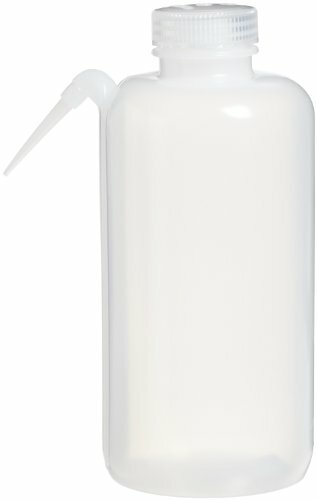 This bottle is suitable for storing and transporting labware washing solutions.